FileMaker Pro 11, the latest version of the Mac database software, was officially released Tuesday, packing in improved chart visuals, "on the fly" reporting, a new Quick Find capability, and a number of productivity tools that aim to make database creation simpler and quicker. FileMaker Inc., a subsidiary of Apple, revealed the latest version, which it said delivers many new features for creating professional solutions quickly. FileMaker Pro 11 offers new ways to create, share and visualize databases. Also released Tuesday were updates to the entire FileMaker product line, including FileMaker Pro 11 Advanced, FileMaker Server 11, and FileMaker Server 11 Advanced. "FileMaker Pro 11 is designed for solving real-world business problems, such as the need for interpreting business data," said Ryan Rosenberg, vice president, marketing and services, FileMaker, Inc. "With easy-to-use integrated charting, we bring dynamic visual reporting to FileMaker Pro 11 users. We also provide new tools to boost all users productivity, helping novice and expert users alike build, share and publish better databases." FileMaker Pro 11 is carries a U.S. suggested price of $299, or $179 upgrade, and FileMaker Pro 11 Advanced is $499, $299 upgrade. FileMaker Server 11 is $999, $599 upgrade, and FileMaker Server 11 Advanced is $2,999, $1,799 upgrade. Additional pricing and upgrade information, including pricing for licensed users of FileMaker 8 and 8.5 products, is available at www.filemaker.com. The following are new features in FileMaker Pro 11, according to the developer. 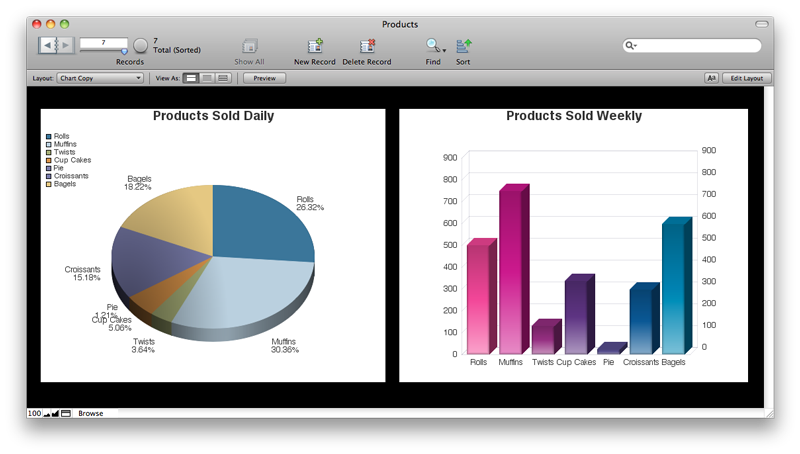 FileMaker Pro 11 offers a selection of dynamic professional-quality charts (pie, bar, area, and line), allowing users to visualize, evaluate and report on data within a new or existing layout. For example, users can add a pie chart tab within a FileMaker Pro layout to see their sales depicted graphically any way they chose  weekly, monthly, regionally and more. FileMaker Charts can also be published to the web using FileMaker Pro Instant Web Publishing. FileMaker Pro 11 users can now easily create "on the fly" Quick Reports in a familiar spreadsheet-like format to easily set up subtotals and totals similar to pivot tables in spreadsheets. A new streamlined Layout/Report Assistant guides users through the process of setting up reports with grouped data. FileMaker Pro 11 also delivers innovative new ways to collaborate with its unique Snapshot Link that flags a specific set of records at a point in time, preserving the same layout, view and sort order. Any changes made to the file are automatically updated in the database. 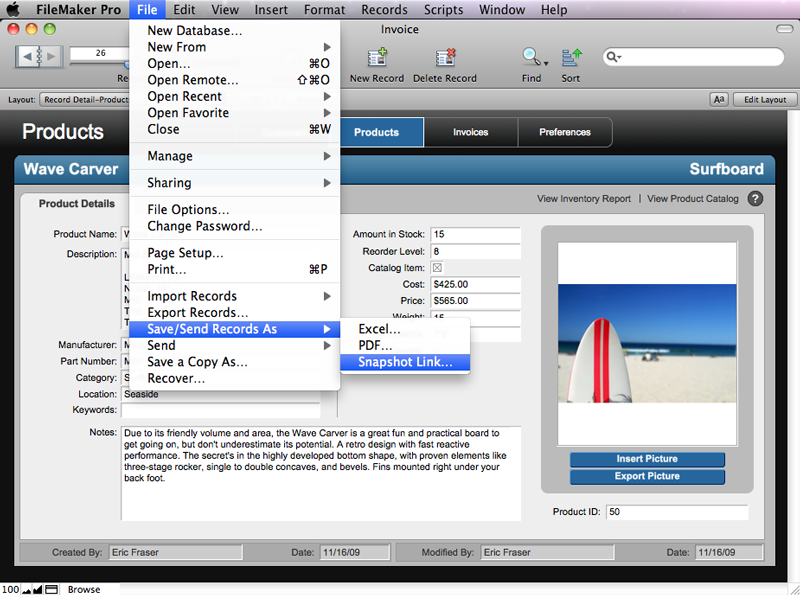 The Snapshot Link file can be emailed to anyone who has FileMaker Pro 11 for easy collaboration. FileMaker Pro 11also introduces Recurring Import, a new feature that allows users to establish an automatic import from Excel, CSV or TAB, the perfect solution for insuring that data is always accurate within a FileMaker record. The new FileMaker Pro 11 Advanced, which offers all of the features of FileMaker Pro 11 plus a suite of advanced development and customization tools, provides a new streamlined, intuitive interface for creating customized menus; the ability to copy, paste and import custom functions into databases without having to re-key information; and an Improved Script Debugger that lets users debug scripts attached to buttons and Custom Menus along with all the scripts on a layout. New in FileMaker Server 11 is an Enhanced Statistics View that provides detailed visibility into FileMaker Pro clients to help diagnose potential issues. The new Backup File Clone allows administrators to save an empty version of any database to help preserve the schema and architecture of a file while troubleshooting. FileMaker Server 11 Advanced no longer limits the number of users that can simultaneously access files over the network and allows managers to securely assign access privileges to groups of users. The last update to the database software came in early 2009, with Filmeaker 10 Pro dubbed as a "breakthrough" release featuring a dramatic redesign to the software's interface.